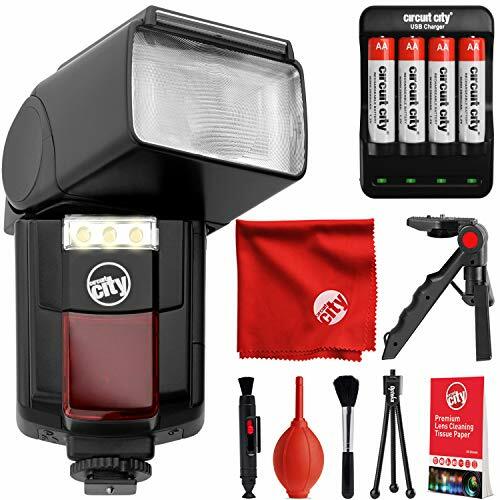 The Opteka IF-800 automatic high-power flash unit with built-in 3-LED Video Light is the perfect accessory for anyone looking for evenly lit video capturing, reduced red-eye or additional power for all types of picture taking. This flash can be effective at ranges of over 131 feet. It reduces shadows and adds depth to your pictures thanks to the adjustable head, which zooms, swivels and tilts. Plus it features a powerful built-in 3-LED light that is ideal for shooting video. It can also be used as a modeling light or as an AF assist light during Live View shooting. Dramatically improve your image and video quality. With todays high definition DSLR cameras every photographer and videographer knows that a quality flash unit and video light are essential components to taking great pictures and quality video. Built-in flashes simply dont have enough power to properly illuminate most subjects, and typically produce harsh shadows, red-eye and other undesirable effects due to their lack of a bounce feature. Built-in video lights are not even an option on most cameras. This external flash with LED video light offers power and versatility you need, resulting in consistently better pictures and higher quality video. Guide Number: 40(105m) / 131ft. Dimensions: 6.7" x 2.9" x 2.2"
Weight: 9oz. (255g) excluding batteries. If you have any questions about this product by Opteka, contact us by completing and submitting the form below. If you are looking for a specif part number, please include it with your message.